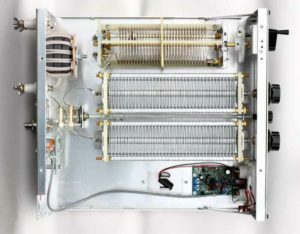 This ATU was modified for forced air cooling, and that increases the accumulation of dust etc inside the ATU (reduced though as the fan is on a timer). After visual inspection, and removal of excess oil and dirt wiped to the end of the roller inductor roller support rod, the ATU was blown out to remove dust that may have accumulated (though in this instance is was very clean). The ATR-30 manual gives no guidance on cleaning and lubrication. As received, this roller inductor had grease applied to the roller cheeks (which is of different construction than most grooved roller contacts), and some of that naturally transfers to the inside edges of the edge wound coil. Though it might seem bad practice, it turns out that this roller inductor has made reliable contact with what is essentially a wiping roller contact. A little poke indicates that the grease still has plenty of retained oil, so no need for work there. The grease is light yellow transparent grease, and appears to be an ordinary lithium based grease, though it may be a high temperature formulation like used on disc brake wheel bearings. It did not have the feel of silicone grease, and certainly no sign of graphite or carbon loading. The roller support rod is bare brass, and lubricated with light oil (10W), a couple of tiny drops from a 0.8mm syringe needle, work through by winding the roller to limits, is sufficient for low wear operation and corrosion prevention without compromising reliable electrical contact. Likewise, a tiny drop on the capacitor bearings suffices. The switch appeared good, so no lubrication, no cleaning needed. Most of this work is due to the use of the roller inductor, and although they are stunningly low Q, hams will not buy high power ATUs with switched inductors, so the market caters for the buyer… who is always right! Now some people reading this will insist that the coil contact should be dry, others that it should be greased, some with “conductive grease” which is actually not all that conductive but risks contamination of insulating parts exposed to high voltages. I have seen one expert advise “silicone graphite silicone grease” as supplied by Palstar. Well, Palstar (who are just one of the many ATU manufacturers) do advertise a “graphite lithium” grease for the roller rod alone, and having not heard of “graphite silicone grease” I Googled and could not find a single product… I think it is a confused / uninformed expert who has invented unobtainium.